​This working group strives to promote a just transition to locally based economies that protect workers, our communities, and the environment. Interested in running a campaign on your campus? Send us an email and we can help you get started!! Created our first ever ​KSEC Strategic Plan​ to meet a statewide objective of "We will unite and uplift our voices to resist all new threats to our communities and our environment. 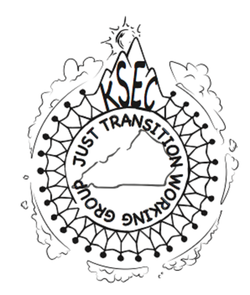 We will no longer be ignored"
KSEC Just Transition Working Group hosts its first Solutions Summit to talk about what young Appalachians want for their region and participate in the region's just economic transition away from extractive industries. KSEC launches its annual summer program, Catalyst, a youth-focused, anti-oppressive, inclusive, week-long training for folks interested in becoming activists and who want to make a difference on environmental and social justice issues. Kentucky young people meet up in Washington DC for the first national Power Shift conference and realize that there are a lot of young Kentuckians concerned with the environment. Registered voters and did youth environmental voter turnout work with the Power Vote Campaign. Over 100 Kentuckians head to the 2009 National Power Shift Conference in Washington, D.C.